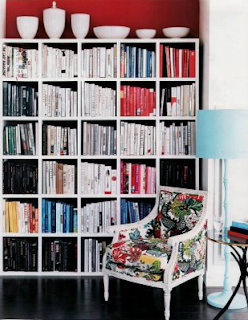 Something that I have seen when looking at different decor sites are some rooms with bookshelves that have books organized by color. I LOVE this look! 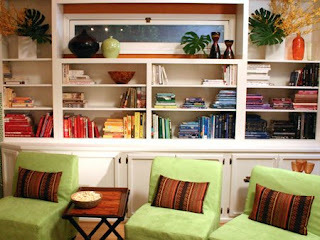 I think it it such a great way to bring a pop of color and warmth to a space. I tried to do it once myself - but didn't have quite enough books in all the colors, so need to work on that. 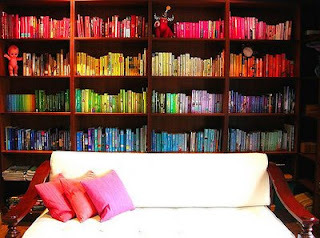 Even if you do not have all of the colors of books - you can choose 2 or 3 colors - that would look cool too. If you are trying to collect a lot of books just for decorating purposes there are some places that you can find them for very cheap. Large chain bookstores such as Barnes and Noble, Davis Kid, Books -A- Million, Borders and others often have a table with books marked way down, you can really find some great deals. I have also gone to our local Dollar store (yes, the dollar store) and bought hard back books for only a dollar each. So that is great way to get a bunch of books at a low price. I did this when I was needing to fill up a book shelf. I still need to by more actually, so I may need to make a trip there myself. I love books and being surrounded by them and all of the knowledge and stories they hold. It's fun to collect books and have your own, personal library. 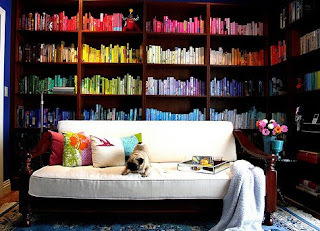 I just love this idea of organizing books by color and pictures of rooms like this make me happy!